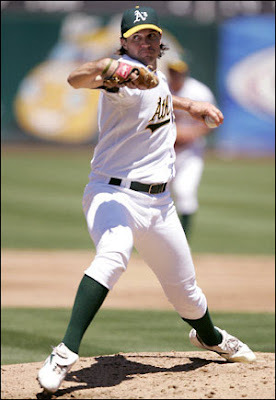 Barry Zito was always a little overrated when he was a member of the Oakland Athletics. That meant that rather than an annual Cy Young contender he was more like a slightly above average starter. There are a million theories about what has happened to him since then -- everything from growing lazy to missing his old pitching coach. But what is absolutely certain is that thus far he has been a disaster for the San Francisco Giants and the fantasy owners that have drafted him. This period may be coming to a close. Barry Zito has shown increased energy and a real desire to recover what he has lost this spring. And while this is certainly subjective noise, it is starting to bear out in his spring stats. Observers like manager Bill Bochy and center fielder Aaron Rowand have noted that his control has been much sharper and he is pitching in a sytle closer to the way he pitched in Oakland. His spring stats still don't look very good but they have been much better in his last two starts and the new found energy has been present throughout spring training. Fantasy owners shouldn't target Zito in fantasy drafts but in leagues where you have the ability to hold him in reserve or easily replace him -- Zito is becoming worthy of a late round speculative pick.